Today's IT professionals understand the impact of information technology on business. Unfortunately, IT pros aren't always recognized as strategic partners who can help increase business-IT alignment to drive an organization's success. 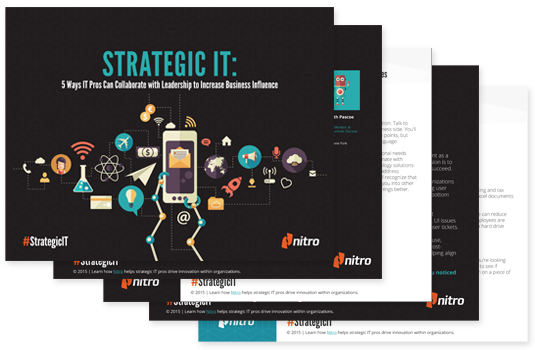 Our eBook, Strategic IT: 5 Ways IT Pros Can Collaborate with Leadership to Increase Business Influence, compiles field-tested advice from technology professionals in diverse roles. Download it for insights you can use to better collaborate with management and increase business influence - whatever your role.